In this interview, William Lacefield, Superintendent of Shelby County Schools, discusses his background, the merger of city and county schools, students from surrounding counties, school boards, and the school system's budget. In this interview, Sovel Stephens, Superintendent of Russell County Schools, discusses his education, why he came Superintendent, the school board and elections, along with his duties and daily activities. In this interview, John W. Marsee, former Superintendent of Garrard County Schools, discusses his education, his prior positions, the Marsee family, and his duties as Superintendent. He also comments on problems he faced and other issues. In this interview, Charles Harris, Superintendent of Somerset City Schools, discusses his education, his years at WKU, why he made a career in educations, prior positions, and other issues dealing with his job as Superintendent. Interview with Hugh Adams Jr. In this interview, Hugh Adams, Jr., Superintendent of Jessamine County Schools, discusses the problems of his position and also the things that he enjoys about being a Superintendent. In this interview, the former and current Superintendents of Lee County School discuss how they became Superintendents, the School Boards and their relationships with them, and the changes that have been made in the system over the years. In this interview, Elbert Hudson, Superintendent of the Lee County School system, discusses his education, prior positions, the School Board, size of his system, and contributions and problems in Lee County. In this interview, Ernerst Wiggins, Superintendent of East Bernstadt Schools, discusses his education, former jobs, military service, previous coaching jobs, and other various aspects of the job of Superintendent. In this interview, Othella Gaskins, Retired School Superintendent of Russell County Schools, discusses his education, the School Board and elections, conrtibutions he made during his time, and his many experiences as an educator and administrator. 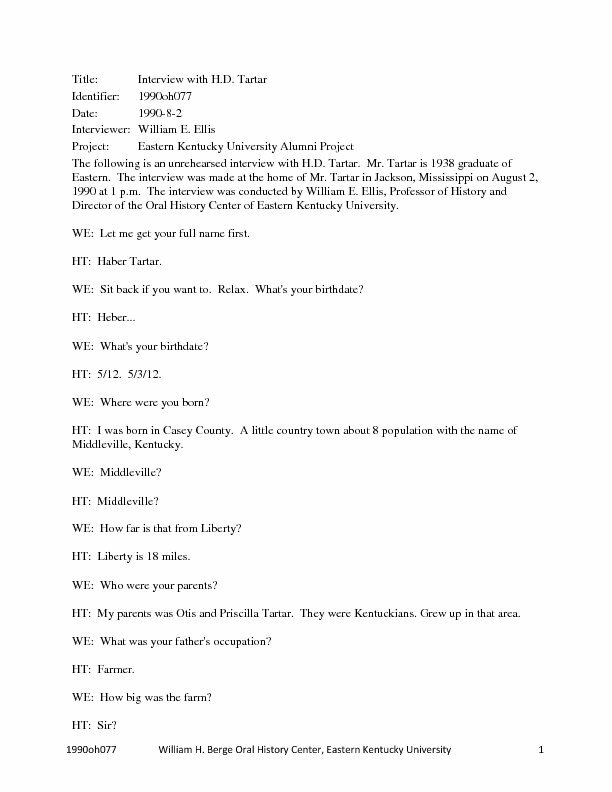 This interview with Charles "Turkey" Hughes is on his athletic career at the University of Kentucky. He was a prominent coach and teacher in the Physical Education Department at EKU in the 1930s and 1940s. Mr. Donald Feltner received his B.A. and M.A. at Eastern and has served as Director of Public Affairs since the mid-1950's. He had a close working relationship with Dr. Martin on many important projects. 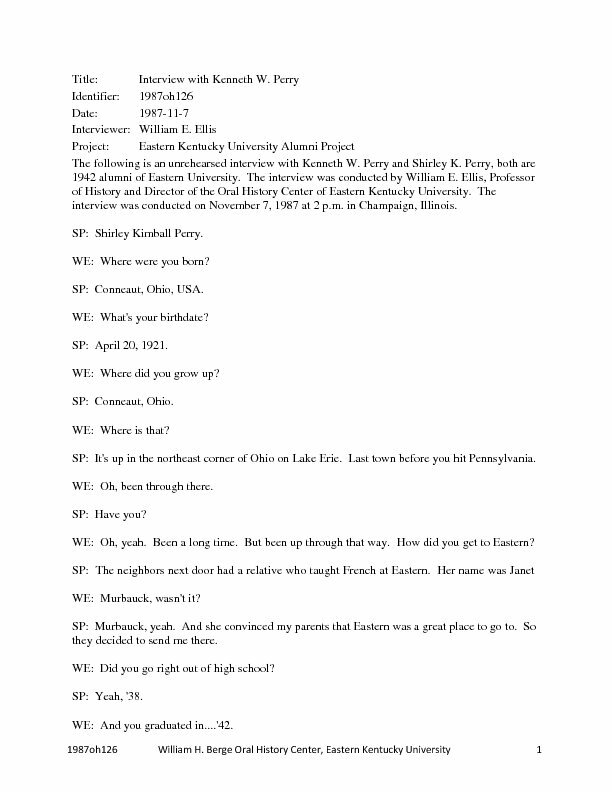 The following is an unrehearsed interview with Norman A. Deeb, a 1947 graduate of Eastern. He holds a Ph.D in Education and currently teaches at Western. This interview is taped in conjunction with the Alumni Project.